Neal and Miggy sail to the mediterranean for an extended cruise. This blog will describe our preparation and progress, our problems and our successes. Family and friends can keep in touch with us, let us know your views and thoughts. The spring flowers had gone but the Ionian Islands were as green and lush as they were when we left to go east in April 2009. No wonder because it rains a lot here. For most of the first and last weeks of September the rain and mist gave our anchorages a spectre more akin to a Scottish Loch than the Mediterranean in late summer. 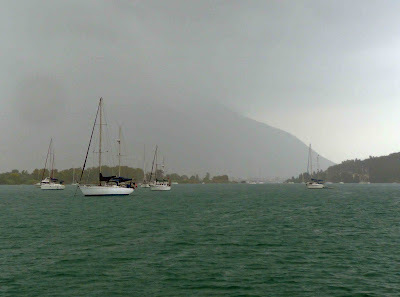 So wet and windy has it been that we feel the onset of winter and so we have sought the shelter and convenience, particularly that of constant electricity and water, of Lefkas marina where we have been delighted to meet up with old friends. Whilst in the Ionian we have visited those places that we failed to see the last time we were here. Ay Euphemia, Cephalonia, is a pretty little place with a fairly well sheltered harbour but few other facilities for yachtsmen except the inevitable Tavernas. Even the Bank and its ATM have been closed. We endeavoured to hire a car to tour the Island but there was not a car available for a week! 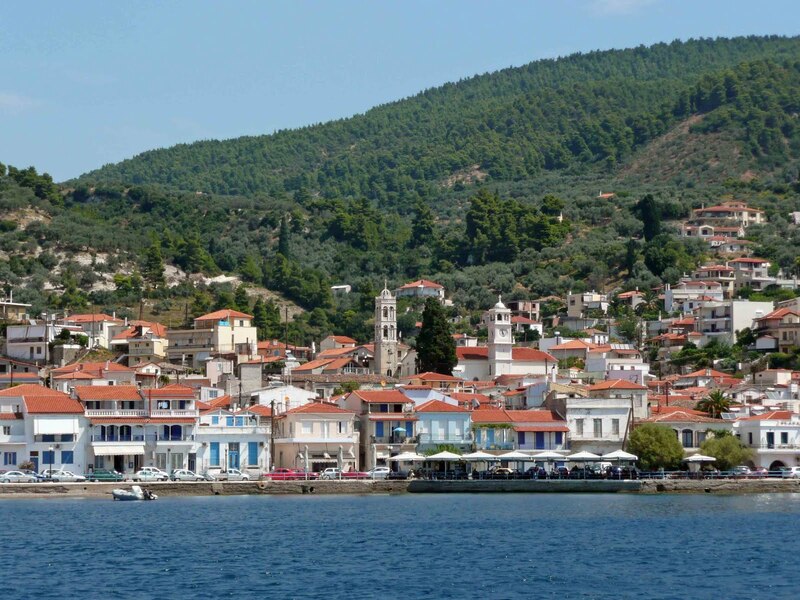 We therefore caught a bus to the visit the capital of the Island, Argostoli, thereby seeing a little of the Island of Cephalonia on the journey. The Island is mountainous with its highest peak of 1600m. The valleys and lower slopes of the mountains are green with olives and the unique Cephalonian pine. 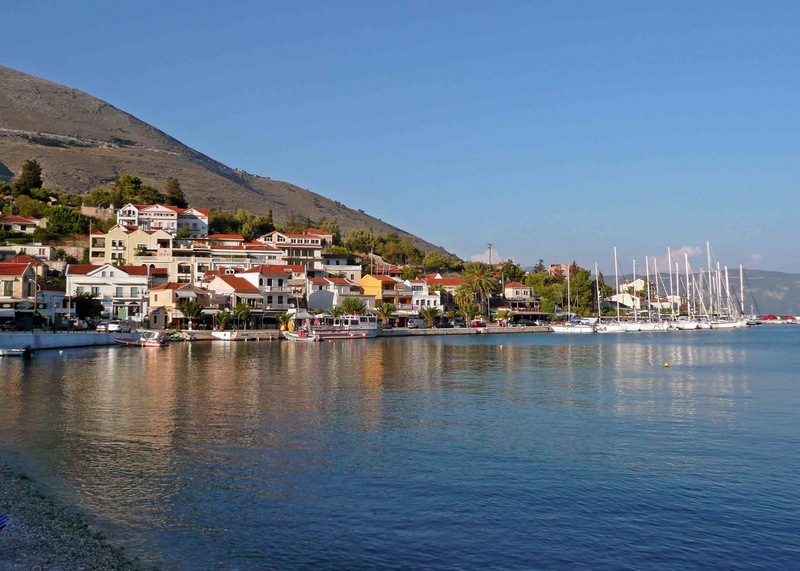 Cephalonia was first inhabited in 50,000BC and has had a chequered history of occupation ever since but it is the Venetian influence that remains dominant not that many original buildings of that period or any other remain after the devastating earthquake of 1953. 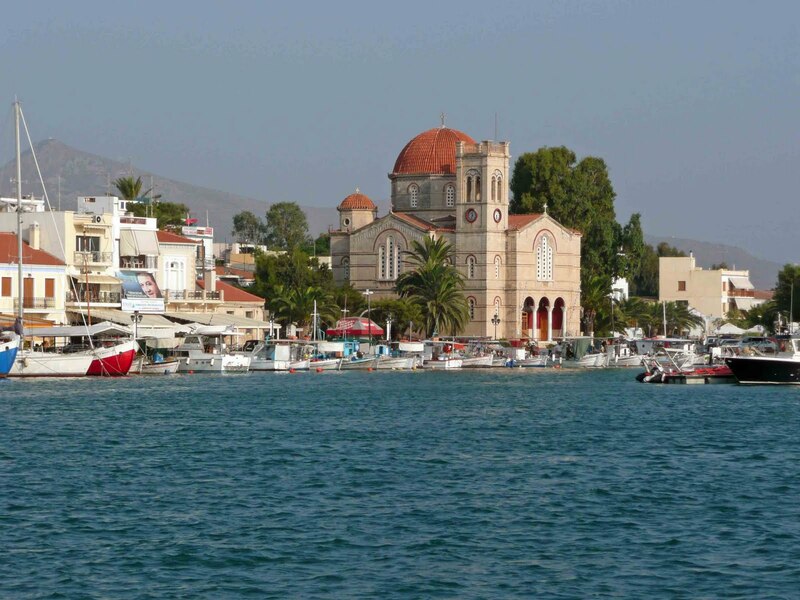 Argostoli has been reconstructed quite sympathetically however. Evidence of that earthquake abounds throughout the Island with abandoned villages and ruined buildings. We were invited to the nearby village of Makriotika for the festival 'Gennisis tis Theotokou' marking the end of summer and the birth of the Virgin Mary, an important date in the Orthodox calendar. We eat souvlaki and drank local white wine, listened to live traditional Greek music and watched folk dancing by the local population. There is a hint of Russian, Jewish and even Irish in the dancing. At around 0100 we had had our fill of the evening's festivities and, being without transport, started to walk the 4km back to the boat but, thankfully, Miggy hitched a lift from the first car that passed. It was an enlightening and enjoyable evening. As is generally the case the wind arranged itself so that it was on the nose after every corner we turned on the way from Ay Euphemia to the village of Kioni on the east coast of Ithaca. The entrance to the bay in which the harbour lies is marked by three old windmills on the southern headland. The bay itself nestles in the densely wooded slopes of pine, cypress and olive on which the whitewashed houses of the village are huddled. In twenty years the number of school kids fell from 600 to 20 as a large number of the inhabitants emigrated to America and Australia. Many of the houses, some of which are in ruin and others neglected, are still owned by these expats. Summer holiday villas and apartments have sprung up on the hillsides to supplement the falling population but our guess is that the place goes to sleep in the winter with very few inhabitants remaining. 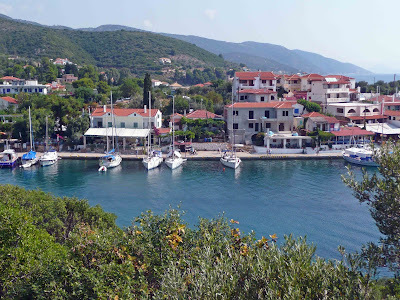 Nonetheless this is probably the prettiest place that we have visited by sea in the Ionian. The Islands of Kastos and Kalamos are charming but their harbours are, like the entire Ionian even in late September, filled to capacity not only with flotilla loads of charter boats but also with what I term the British Ionian Brigade, the Northern Division of which is prevalent. 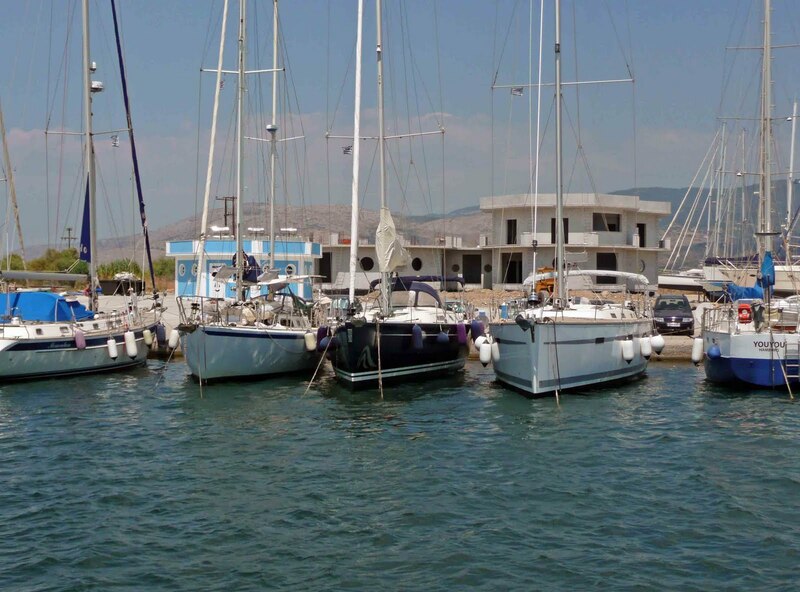 Members of this Brigade tend to keep their yachts in the Ionian and sail them from time to time in the summer months either following an established route between restaurants or hogging space on town quays and going nowhere! Spring is the time to sail in the Ionian and, indeed, any of the popular areas in the Mediterranean, Adriatic or Aegean. 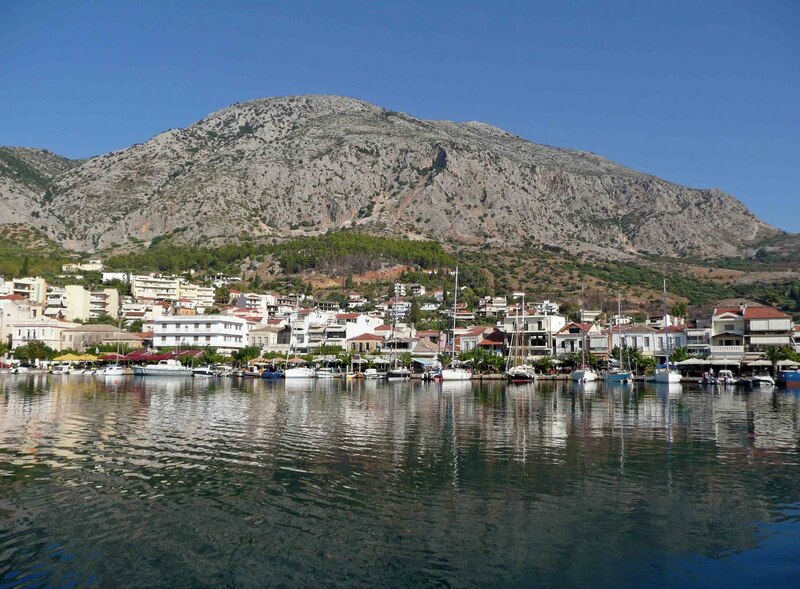 The town of Palairos on the mainland deserves a mention if only for the 'Taj' restaurant where one eats superb Indian curries with the Mediterranean water lapping at one's feet. The sun has now set on the final day of our voyage of adventure during which we have sailed 8000 miles and visited 280 harbours and anchorages in eleven different countries. Our enjoyment the last five years has been immense both on the water and ashore during the winter exploring the culture and history of our host nations and living with the people of those nations. Our forays inland have taken us to diverse locations such as the white villages, the Alhambra and Seville in Andalucía, an oasis camp in the Sahara Desert, Venice, the ancient cities of Mycenae, Delphi, Delos and Olympia as well as the Pindos mountains and the rock top monasteries of Meteora in Greece and the strange and unique Cappadocia region in Turkey to name but a few. We have been fascinated by the wealth of history in the Mediterranean and have followed in the footsteps of Odysseus, St Paul, two St Johns and the Virgin Mary, the Crusaders, the Phoenicians, Alexander the Great and a host of Roman Emperors. Many people have asked us 'why are we giving up'. We tell them that we have achieved what we set out to do during our five year project having seen and done all that we wish in the Mediterranean and that we are not giving up sailing, it being in our blood. We will miss Bella enormously and being without a yacht on Lymington River will be a strange feeling after so many years. Miggy and I have bonded better than ever during our life in a shoebox, we understand each other more fully and have grown more tolerant of each other's shortcomings. Opinion as to whether or not we would live aboard for an extended period again be it in the Mediterranean or elsewhere is, I believe, divided between us. Life is short, however, and we are of like mind in wishing to see more of the world and to settle back in the UK once again amongst our family and friends. On this note we are looking forward with relish to spending Christmas and the New Year at home. Rather than face the dragons, storm and tempest that lurk off Capes Matapan and Tainaro in the southern extremities of the Peloponnese we continued our journey westward the way we had travelled east by way of the Corinth Canal. Having paid our dues we waited an hour or so for the westbound convoy to be summoned boat by boat to proceed to transit this 19th century feat of engineering. Two large Greek RIBs jumped the queue as is the custom in shops wherever these people are faced with others in front of them. We were astounded to discover that there is a word for queue in the Greek vocabulary! On our way through the Corinth Gulf we stopped at Galaxidhi and the island of Trizonia both of which were as delightful as we remembered when we last called in April 2009 albeit now crowded with tourists and yachts. 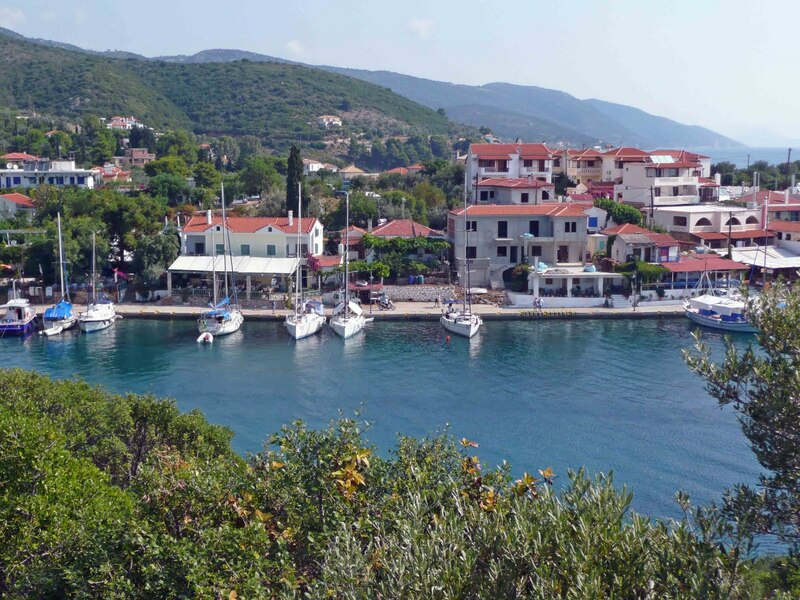 Trizonia was Onassis's first choice of island to buy but, being unable to agree terms with the locals, had to settle for the island of Skorpio in the Ionian. It was mid August and overbearingly hot with temperatures climbing to 38°C in the shade by mid afternoon. Whilst we have a windscoop and ample shades in the form of foredeck and boom awnings and a cockpit bimini with side flaps and various other bits of material, Miggy found herself spending a lot of the day moving the covers around to blot out the ever moving sun and to take advantage of any zephyr that graced us with its presence. To make matters worse temperatures below were such that we had to begin our slumbers in the cockpit until able to transfer to the forecabin in the early hours of the morning. In Galaxidhi Andreas Grivas still stalks the quay selling fuel, water and electricity to unsuspecting yacht owners, the latter two commodities at the highly inflated price of 5€ each for 24 hours. This bully ordered everybody to pay with no grace whatsoever. We refused to do so until he asked us politely with at least a please in English or Greek and also to give us a receipt. The saga concluded with this man threatening to throw me into the water and indeed manhandling me with that intent. This was witnessed by Angelo, a superb ambassador for the town, who suggested we report the matter to the Port Police. This we did through a translator bought in for the ocassion over a period of four and a half hours; not that this worried us as we were in the welcome cool of an airconditioned office. It transpired that they have a file on Grivas in respect of false accounting and the Captain of Police was grateful for our evidence to support their imminent action against the man. We were asked if we wished to press personal charges for assault but we declined wishing only to help the townsfolk be rid of this objectionable thief. The moderate easterly breezes forecast for our sail from Trizonia to Messolonghi in the Patras Gulf turned out to be 25 knots shy on the quarter. Bella romped along at over 7 knots under poled out genoa and full main. Having passed under the magnificent Rion suspension bridge we did put a slab in the main and a roll in the genoa and it made no appreciable difference to Bella's speed. She loved every minute of it as did we. With the tide under us as well we arrived at Messolonghi, meaning 'amid the lagoons' a couple of hours sooner than we had expected. We sailed up the dredged canal past the Pelades or fishermen's houses standing on stilts in the shallow waters of the lagoon reminiscent of those we have seen in Thailand or Borneo. Sifting shellfish from the mud of the lagoon, particularly the golden-shelled fan mussel is however a diminishing livelihood and the majority of the former huts have been extended and upgraded as holiday homes. 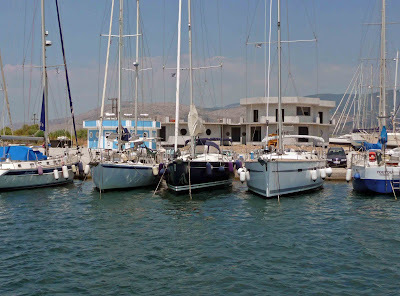 We dropped anchor in the rather bland, but protected part of the lagoon that purports to be Messolonghi harbour but has little or no facilities for yachtsmen except a developing marina. Two pontoons connected to the shore are in place complete with water and electricity and more are planned but yachts are generally berthed too close together. The marina office and a small shower block with washing machine have been built and a larger replacement building is nearing completion but is unlikely to be so completed for this winter. Let us hope for those who overwinter here that we are wrong. Modern concrete Messolonghi town has little to show to reflect its significant place in the history of modern Greece. In 1821 the town became the centre of resistance to the Turks during the War of Independence. Very few of the fine buildings that would have graced the streets when Lord Byron came to fight for the liberation of Greece in January 1824 remain and those that do lay in ruin. The poor chap had little time to fight for the cause in which he believed so strongly as he died of malarial fever just three months after his arrival in Messolonghi at the tender age of 36. He remains a hero of the town and underneath his statue in the Garden of Heroes is said to lie his heart. Two years later nine thousand Greek fighters battled their way through the year long Turkish blockade of the town; those left behind detonated explosives just as they were taken by the enemy. This self sacrifice led to the Turks surrendering Messolonghi in 1928 without firing a shot. 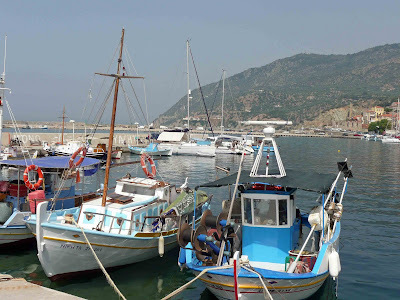 We sighted Messolonghi harbour's large and, we guess, old resident turtle and on the way out of the canal we were accompanied the resident dolphin. 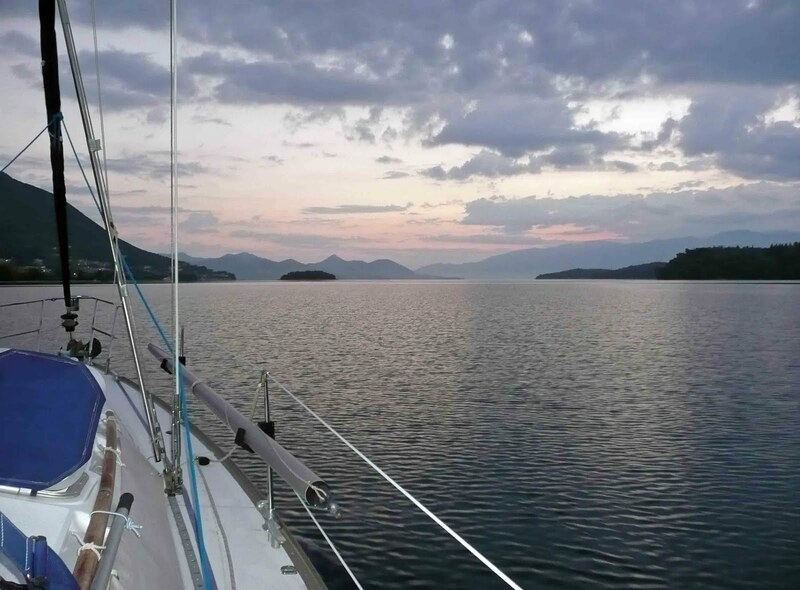 As we entered the Ionian Sea from the Gulf of Patras the wind turned to the west just as forecast and we had a delightful beam reach in no more than 15 knots up the mainland coast to Astakos. Byron stopped here, when the town was called Dragomestre, on his way to Messolonghi. We wonder if Byron experienced, as we did, the overpowering smell of sewage in the harbour. Although no raw stuff is visible there are vast shoals of grey mullet scooping back and forth on the surface of the water; a sure sign of very unpleasant things. 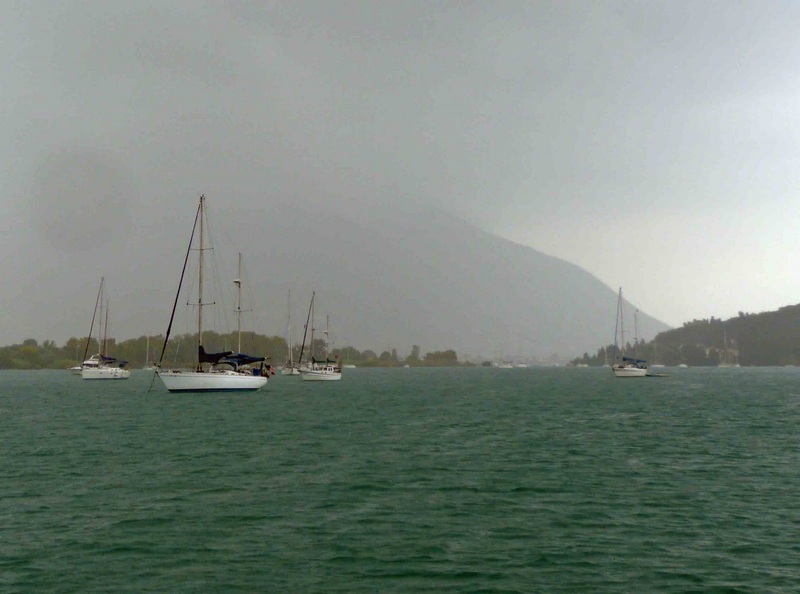 Our previous visit to Astakos was in 2008 during our winter tour when these ghastly conditions were not evident. Old times' sake brought us here but we certainly won't be back again. We are, however, back in the beautiful Ionian Islands and the great pleasure of meeting up with a number of old friends has relegated things not so good to the most distant part of our memory. With the Sporades behind us to the east the next leg of our journey was to take us south down the Gulf of Evvoikos along the western coast of Evvoia and into the Saronic Gulf. The chequered history of Evvoia from Macedonian rule in 338BC to Turkish government in 1833 has left a range of religious cultures from Greek Orthodox and Islam to the descendants of 15th century Albanians who still speak their own dialect of Arvanitika. Immigration clearly remains a problem with the influx of Indian, Pakistani, Bangladeshi and eastern Europeans in significant numbers evident on the Island; undoubtedly an illegal back door into Europe. 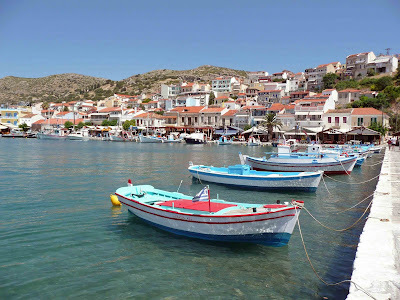 Evvoia is Greece's second largest island and its scenery varies markedly from the fertile green valleys and pine covered mountains of the north, reminiscent of the Sporades, to the barren rocky landscape of the south echoing that of the Cyclades. A Greek mainlander remarked to us that 'Evvoia is different'. It is and on the whole we were unimpressed with the Island. This may be a jaundiced view as we saw just the coastal strip, being unable to explore inland as car hire was unavailable in the limited number of places that we felt comfortable about leaving Bella for any length of time unattended. Apart from the small ports of Limni, a wealthy 19th century seafaring town with character and charm and Karavos, where we had our seawater pump rebuilt by a tractor dealer who dabbles expertly with marine engines, the towns along the coastal strip were uninteresting bottom of the market tourist resorts mainly frequented by Greeks on holiday or on day trips from the mainland served by a disproportionate plethora of car ferries. Even Eretria, the site of the important ancient city state, ranks among these easily forgotten places although we do remember its anchorage and the extreme discomfort therein due to the wash of constant large roro ferries driven too speedily by lunatic so called professional masters whose grasp of seamanship is nonexistent. It is my belief that these 'drivers', like the majority of young and middle aged Greek men have their brain cells lodged, by some quirk of nature, in their testicles such is their excess of testosterone. 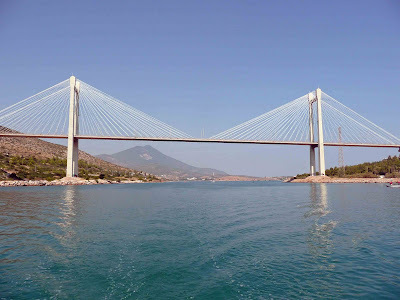 Chalkida, the noisy dirty capital of the Evvoia, is hardly worthy of comment in this blog except on two accounts, its road bridge and its tides. 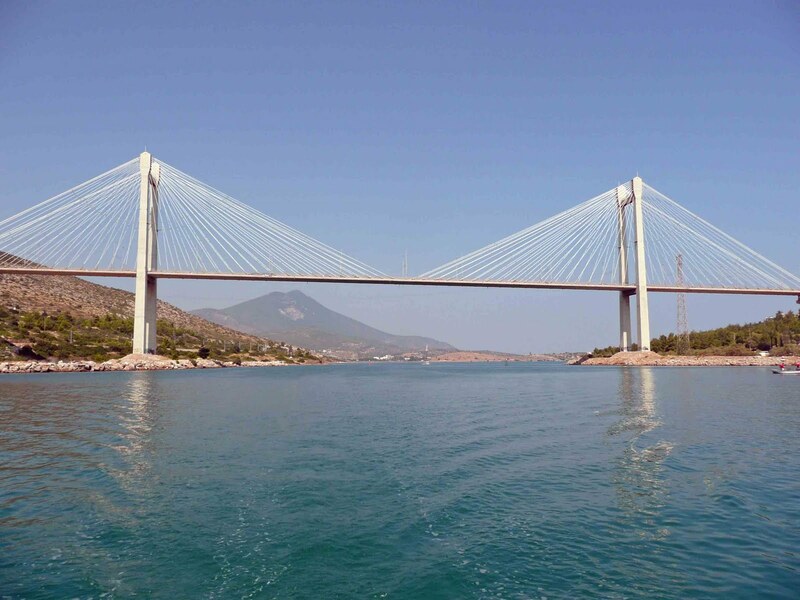 A bridge has spanned the narrow fast flowing Euripus channel separating Evvoia from the mainland since the 6th century BC. Legend has it that Aristotle was so frustrated at being unable to fathom the ever changing current flowing under the bridge that he threw himself off the bridge into the current that perplexed him so much and drowned. Quite clearly Rod Heikell, author of the Imray Greek Waters Pilot, is also confused by the tides here. Contrary to his statement that there is no tide flowing through the berths on the east quay it flows like the spring ebb in the Needles channel. Perhaps god Rod should do the honourable thing and follow Aristotle's example, metaphorically speaking of course; we would wish him no harm. This is just one of the many significant discrepancies in Heikell's work. 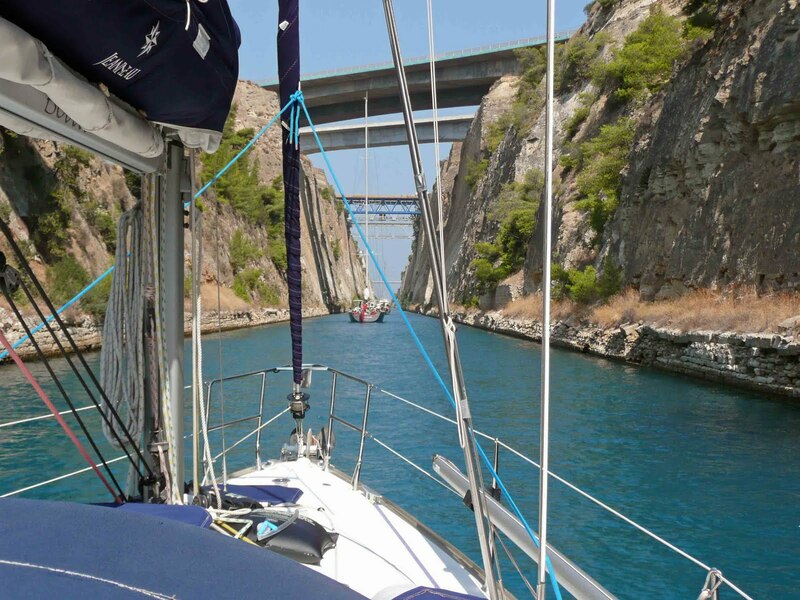 Although we gather that a new edition of the Imray pilot is imminent, yachtsmen cruising Greek Waters may be better served with the Greek Pilot 'Greece – Sea Guide' published in four volumes. These are expensive but superb with detailed charts and excellent pilotage notes in English as well as Greek. Alternatively there is a series of Greek charts with excellent harbour plans and pilotage notes in English. Once one has located the Port Police office that deals with bridge opening, one of four Port Police buildings and tucked away in a back street without a signpost, one has to establish, with some difficulty it must be said, whether or not the bridge will open that day. It has scheduled closing days during the summer and in addition unscheduled days due to understaffing, strike or pure laziness. We had to make four or five visits to the office involving a long walk in the sweltering heat to finally get confirmation of bridge opening and to pay for our transit Actually getting through the bridge is another matter; one has to listen on VHF Ch 12 from 2200 for a 20 minute warning that the bridge will open. This could be at any time from 2200 until the early hours depending upon when bridge control reckons there is slack water. At this point bridge control will announce who transits first, northbound or southbound traffic. Having determined this each vessel is called individually with permission to transit. We were called at 0230 and after waiting for 16 vessels to transit northbound transited the narrow opening in a strong adverse tide. Slack water my foot! If it were not so annoying this would all have been highly amusing. The Port Police administration is typical of officialdom throughout Greece; overstaffed, ineffective, disorganised in the extreme and buried under mountains of unnecessary paperwork. 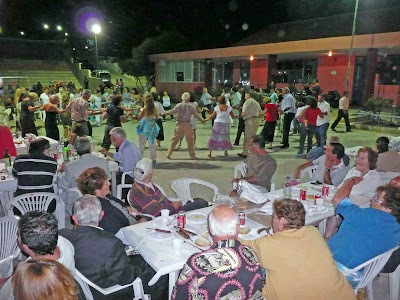 It is no wonder that Greece finds itself in its present position with an inept Government and a flawed economy when the majority of its male population avidly follow the national pastimes of avoiding work and evading taxes. Oh, they do have one other; eating and drinking coffee which they do incessantly at any time day and night. 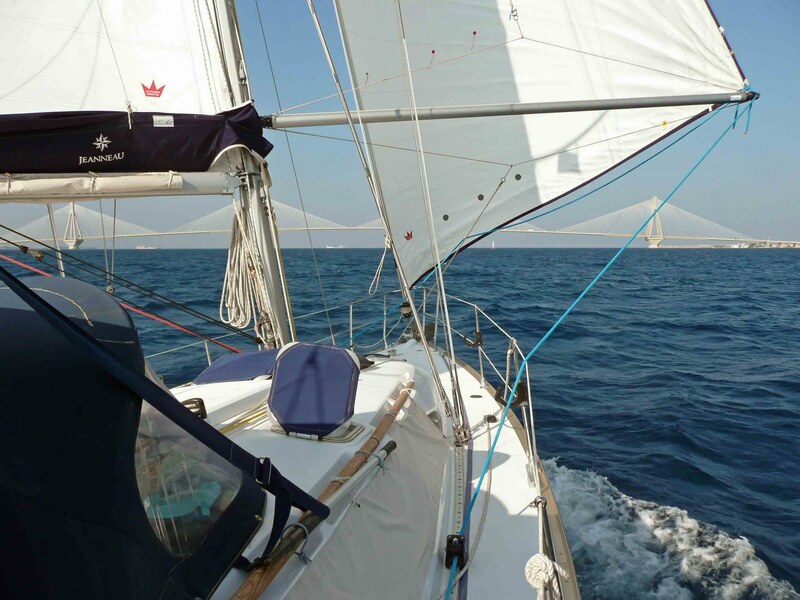 We had some good sailing in the Evvoikos Gulf however which at times turned out to be somewhat livelier than expected necessitating frequent putting in and shaking out reefs in mainsail and headsail in the strong gusty breezes. Now on the more pleasurable part of this episode, the Saronic island of Aigina and Nea Epidauros on the north eastern coast of the Peloponnese. 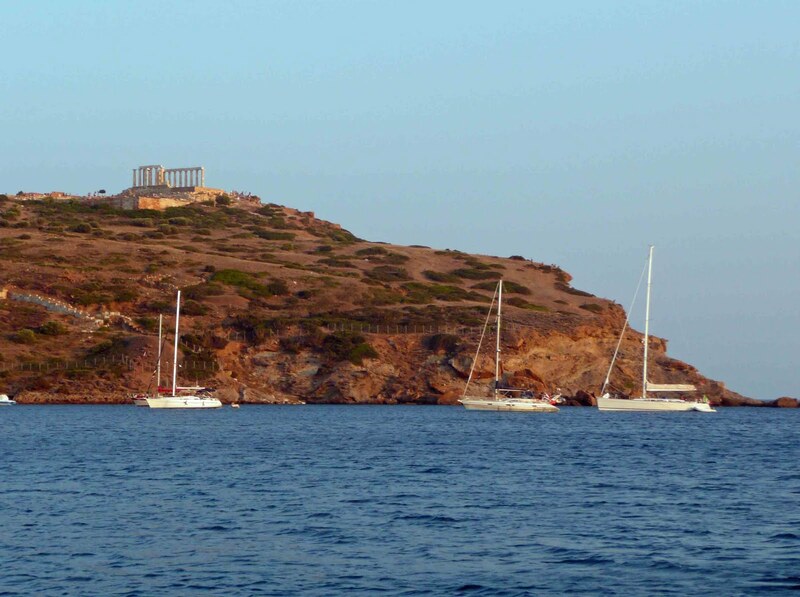 To reduce the journey time from the south of Evvoia to Aigina we called in at Porto Rafti on the mainland for a night in a pleasantly secure anchorage and then at the delightful, albeit windy, anchorage at Ormos Sounion further south. 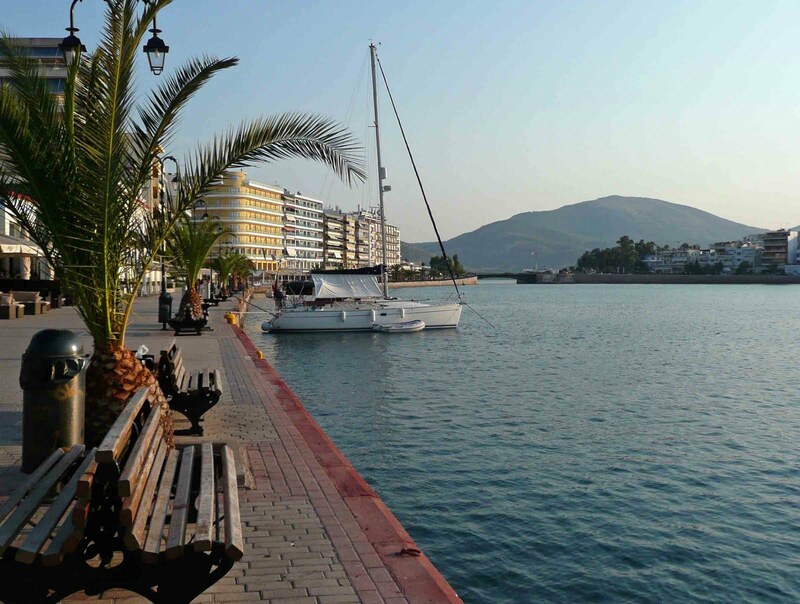 The Saronic island of Aigina, our next port of call, has been inhabited for 4000 years. In the 7th century BC the Island was the first place in Europe to mint its own silver coins which became accepted currency throughout the Greek speaking world. 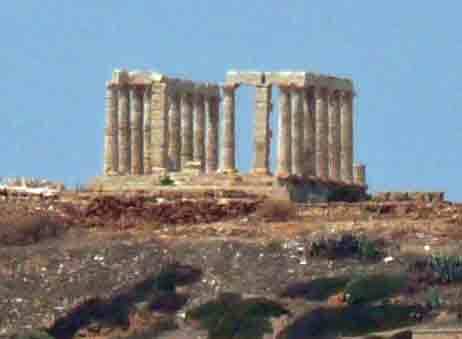 The accomplished seafarers of Aigina controlled most of the foreign trade in Greece thereby accumulating vast wealth and incurring the wrath of Athens, only some 12 miles distant, who finally conquered the Island in 456BC. The fortunes of the Island declined during Turkish and Venetian rule but its prominence was restored in 1828 when it was declared the capital of modern Greece. The realisation that an island is a pretty silly place to place a capital must have dawned quickly as Nafplio took over the mantle of supremacy in 1829 and then Athens in 1834! The port at Aigina town is picturesque but extremely busy with ferries, hydrofoils, a large fishing fleet and more yachts than it can accommodate. 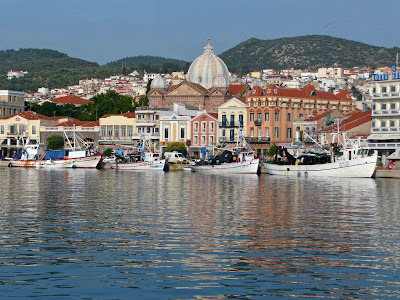 Fine Neo Classical mansions and the fish market on the waterfront and narrow streets make Aigina a charming town and the church of Agios Nektarios a short distance inland is said to be the second largest Orthodox Church after the Agia Sofia in Istanbul. The Island is a prolific source of the pistachio nut and those on sale everywhere in Aigina town are fresh and flavoursome. A minor berthing disagreement with our neighbouring Greek yacht confirmed my opinion, not necessarily that of Miggy, that the majority of Greek men are arrogant, inconsiderate and unhelpful to the extent of being obstructive. There is, of course, the minority who are kind and helpful in the extreme and we have met them all; correction, I meant to say many of them! There is apparently a negotiating procedure that goes on with Greeks to get past the word 'impossible' and continue the negotiation to a conclusion. Miggy has the patience and humility to be able to pursue this tradition but I have neither the time nor inclination to do so. I prefer straightforwardness. It was good to be back in Nea Epidauros again having stayed here during our Greek tour in November 2008. Then the newly completed harbour was empty of vessels and moorings but now is packed full. 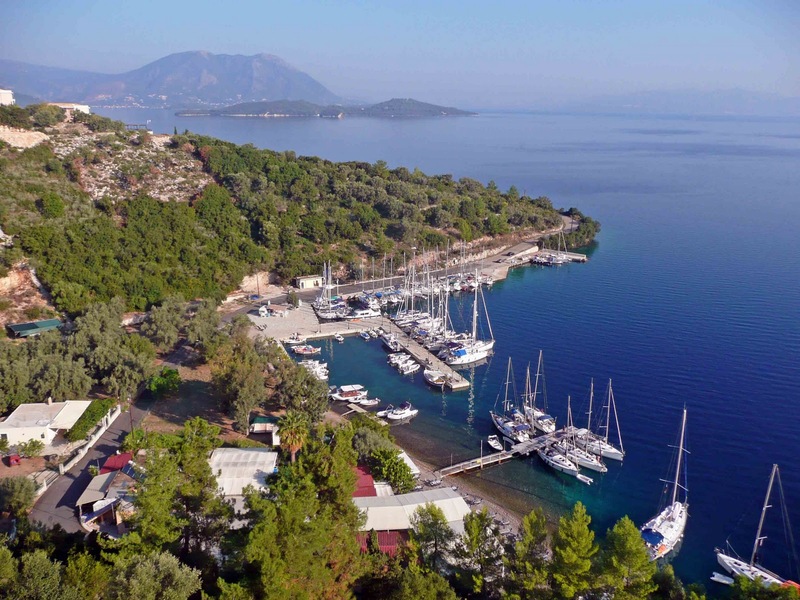 It is a popular place and no wonder considering the hamlet's position in a beautiful bay looking out to sea over the Methana peninsular and the islands of Kira and Aigina. We berthed in the most unlikely place one could imagine managing to pick up laid mooring lines around our keel whilst taking Bella astern through the tortuous narrow passage between obstructions. With the help of Dimitri, the 'harbour master' and one of the 'minority', we managed to free ourselves and walk Bella back into her berth. It is getting hot now with daytime temperatures reaching over 35°C in the shade. Whilst we have a windscoop and ample shades in the form of foredeck and boom awnings and a cockpit bimini with side flaps and various other bits of material, Miggy finds herself spending a lot of the day moving the covers around blot out the ever moving sun and take advantage of any breeze that may grace us with its presence. If you wish to protect endangered species and establish a Maritime Park to do so you have to be serious about regulating the use of the area and policing it. 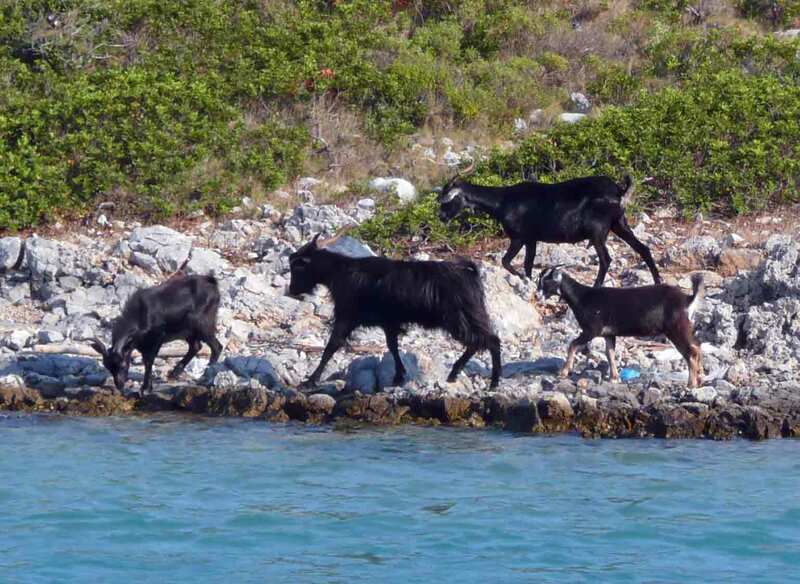 The only such Park in Greece, the Northern Sporades National Maritime Park, established to protect the endangered Mediterranean Monk Seal and other species, is not so regulated or policed. 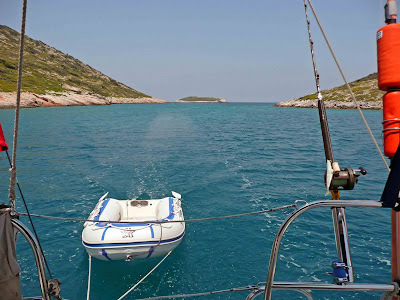 After a good sail from Ay Efstratios we dropped anchor in the deceptively idyllic landlocked bay of Planitis on the island of Kira Panayia or Pelagos. It is no wonder that the last monk seal seen in the area was 15 years ago considering the far from clean water we found in Planitis and the behaviour of large motor cruisers who open their garage doors and disgorge jet skis to buzz around like a swarm of flies for hours on end disturbing not only the wildlife but everything else in the surrounding area including us. It is a shame that someone has not invented a bloody great fly swat that can eliminate these vermin with one swipe. Not a glimpse of the whales and dolphins that are supposed to be here in their numbers but we did have the pleasure of seeing the rare Eleanor's falcon, one of apparently 80 species of bird in the Park and the goats were entertaining. The Seal Rescue Centre at Steni Vala on the eastern coast of Alonnisos, a delightful little port and village, with which we fell in love, is a derelict hut that probably died at the same time as the last monk seal. 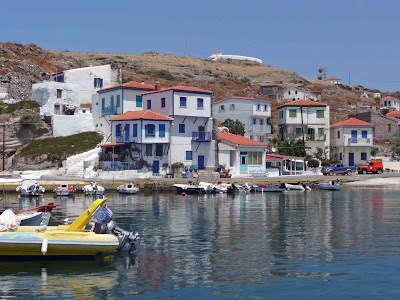 Alonnisos, along with the other Islands of the Sporades, has a lush landscape and undulating pine clad mountains contrasting vividly with the barren and arid rocky islands groups such as the Cyclades. Abundant springs and rivers water the fertile fields and orchards of the interior of the islands to create agricultural self sufficiency and wealth. 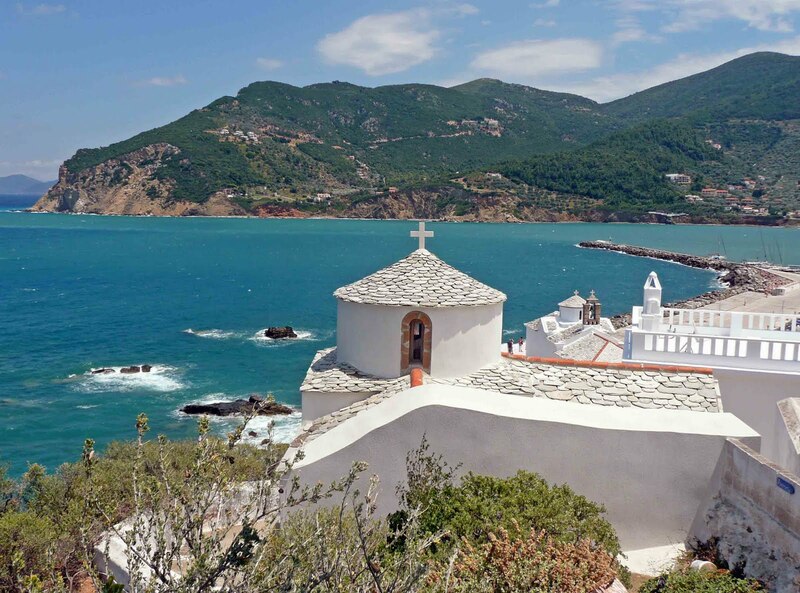 Tourism has flourished since the 1960's when the rich and famous came, some in their yachts, to savour the deserted beaches of Skiathos, Skopelos and Alonnisos. Now the Sporades, Skiathos in particular, have to cope with plane loads of holidaymakers and the likes of us poor yachties! The Islands are known to have been colonised by the Minoans as far back as 1600BC who introduced vine and olive cultivation. Being further north and west than the other Aegean island groups there is perceptible evidence of the long Venetian occupation. 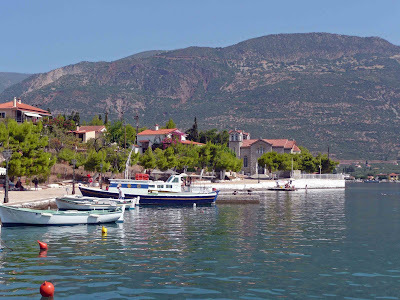 Patitiri, the capital of and ferry terminal for Alonnisos, replaces the former Chora, now a pretty village clinging to the hillside above the town. We berthed by lunchtime but by the early evening two lady Port Police officers told us to move from our berth to make way for some large motor yachts. 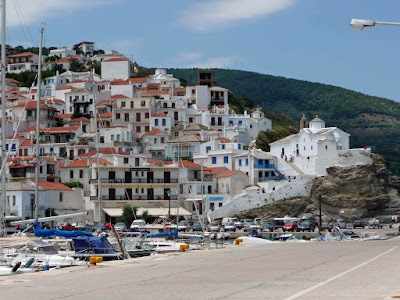 Somewhat upset at this and in the absence of an alternative comfortable berth we decided to travel the 7 miles to Limin Skopelou on the island of Skopelos where we were fortunate to find a comfortable berth in what can be an overcrowded port. Said motor yachts came in to Skopelos the next day. Our guess was that one was carrying some Nob or the other and that the other three were guard boats. 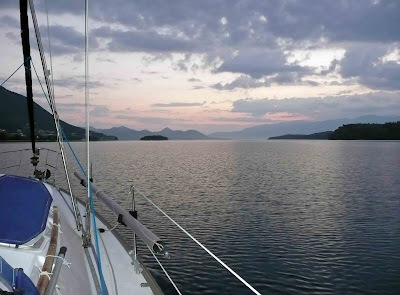 The Port Police at Patitiri did us a favour in prompting our move to Skopelou as at about 0400 all hell let loose with gale force winds and 55 knot gusts. We are sure that our berth at Patitiri would have been untenable in these conditions. There was great activity among the crews of the many yachts berthed here securing extra shore lines, deploying additional fenders and taking up on anchors or rushing about with varying degrees of disfunctionality. We were fine with 40 metres of scope out in 5 metres of sticky mud although our aft boarding plank which was stowed at 45° to the horizontal blew vertical toward the boat and took out a blade from Wendy, the wind generator. Wendy was upset at missing one of her best chances to pump 10 to 15 amps an hour into our batteries that she literally threw a wobbly to the extent that she was about to shake herself and the boat to bits until we managed to calm her by disabling her rotation. When the wind died we admitted her to hospital and made her blade assembly complete with the spare that we carry. Skopelos town, small as it is, has 123 churches or chapels within its boundaries. Sporadhan town houses with flower filled wooden balconies and fish tail slate tiled roofs line the maze of narrow cobbled streets intricately inlaid with sea pebbles and shells. We like the place. We retraced the steps, literally, up to three chapels and the ruins of the Venetian castle that Miggy had taken 25 years ago. 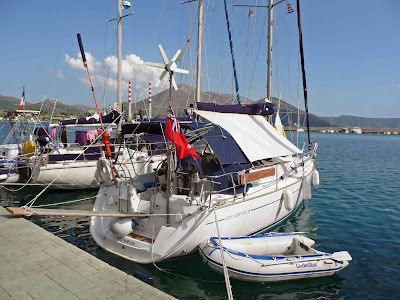 Despite a goodly breeze and a forecast of locally F6 which we thought would be east of us we had a great sail to Loutraki on the west coast of Skopelos which became a bit lively with strong gusts and big wind shifts. We berthed stern to on the visitor's pontoon and watched a Sunsail flotilla tie up on the other side under the skilled instruction and expertise of the young flotilla leader. This guy really knew what he was doing. Not a half an hour after his flock were secure the pontoon on which we were all moored came adrift from the shore. Not to a great extent did it move as it was held to the sea bed by chains and our anchors but enough for the Port Police officer to order us to move. So for the second time in a few days move we did, not to elsewhere in the harbour as we did not favour the alternatives, but to Skiathos town just 6 miles across the water. 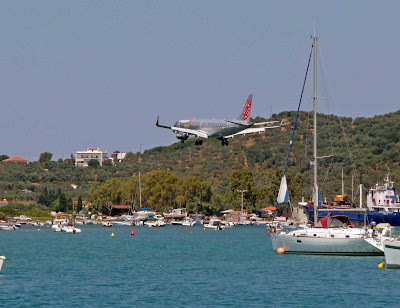 The anchorage at Skiathos is limited by the restricted area under the flight path to the airport runway which was just half a mile from us. 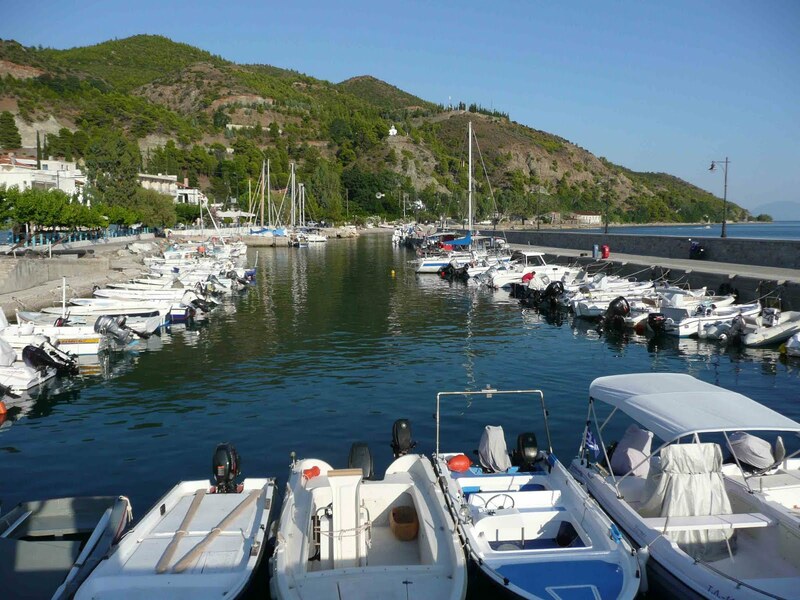 The town quay and pontoon are extremely busy with a melee of charter yachts, large motor cruisers and day trip boats so we are pleased to be away from it all in relative peace and to observe the mooring frolics. At night however our peace was shattered by a disco kind enough to share their 'music' with us and everybody else in the northern hemisphere until 0530. We would have preferred it had they kept their cacophony to themselves! 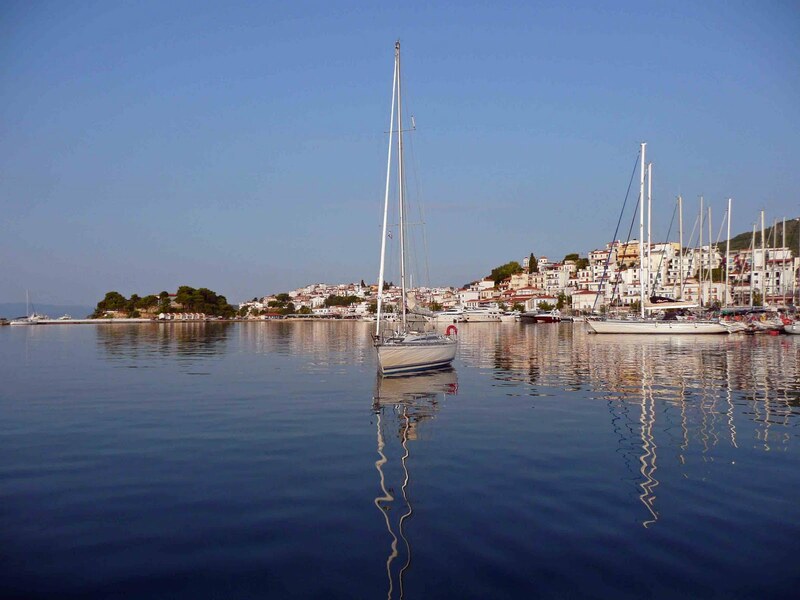 Skiathos town is a pretty place with its cobbled streets and fine mansions but it has been overcome by tourism with all the baggage that entails. How so many tourists can be packed into such a small island defies belief but they come in their thousands each day by endless ferry movements and aircraft. What a difference a day can make! 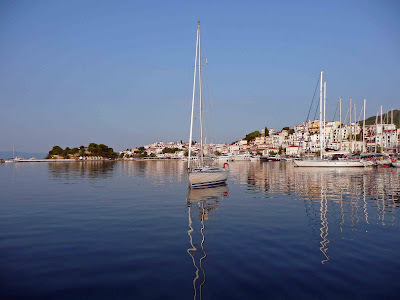 From the noise and bustle of Skiathos town just five hours later we found ourselves moored to the quay in the only hamlet on the island of Palaio Trikeri or Virgin Trikeri measuring less than 2 miles long by 1 mile wide. We can find no explanation as to where the Virgin bit came from but the island does have 70,000 of the estimated 150,000,000 olive trees growing in Greece. So perhaps it is something to do with olives. 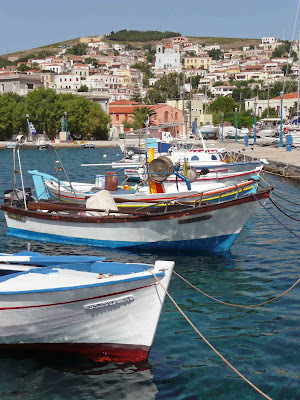 It is an idyllic and typically Greek place with small balconied houses fronting the waterfront of the tiny bay. A few rather smart holiday villas are dotted amongst the pine and eucalyptus on the hillsides and there are two Tavernas. A tractor is the only motorised vehicle on the Island. There is not even a motor scooter, the land borne equivalent of the Jet Ski, which, being rampant and utterly irritating in this Country, should be dealt with the by the aforementioned swat. 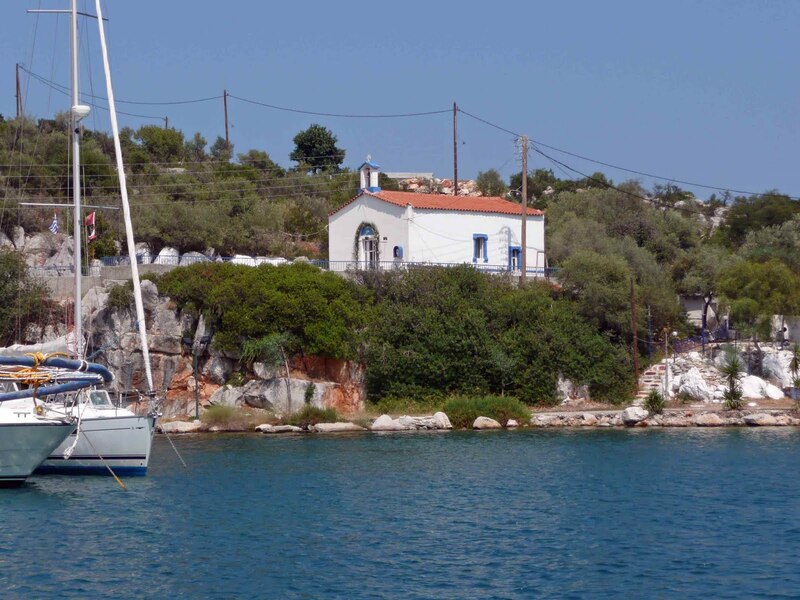 We have enjoyed our short stay in the Sporades Islands. 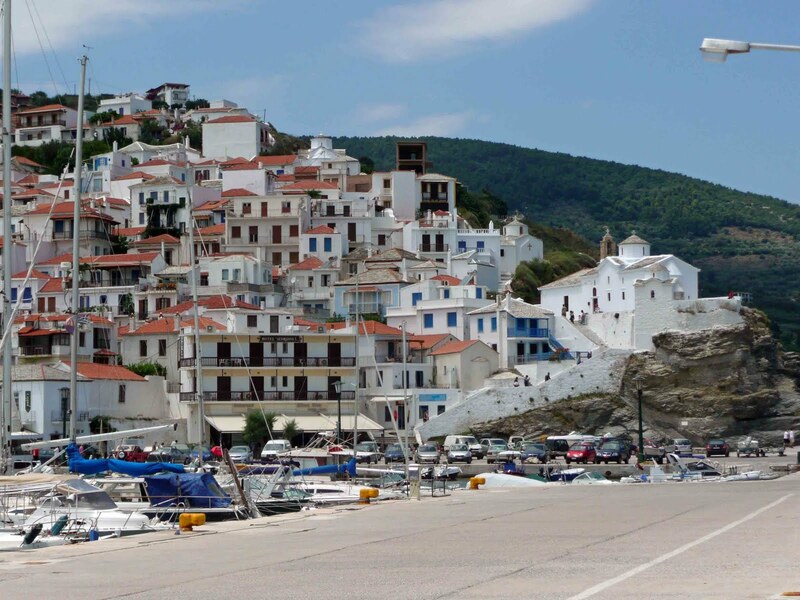 Despite some setbacks, Steni Vala on Alonnisos, Skopelos and the tiny Island of Palaio Trikeri have given us great pleasure. With the season passing so swiftly we now, in the middle of July, move on to the Island of Evvoia about which we shall blog in due course. The wind was fair for our sail from Patmos to Samos and sail we did for a lot of the voyage in winds just forward of the beam ranging from five to twenty knots necessitating a good deal of sail changing. It was good to have what was at times a romping sail. Despite our fears to the contrary the sailing this season going north against the supposed prevailing northerly winds has, surprisingly, been some of the best of our entire trip. 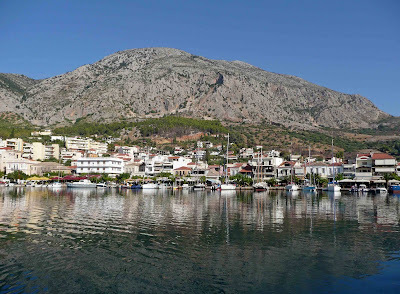 Samos, the southernmost of the North Aegean Islands, an island with high peaks and verdant valleys, is renowned for its Muscat wine and as the birthplace of many mathematicians and philosophers. 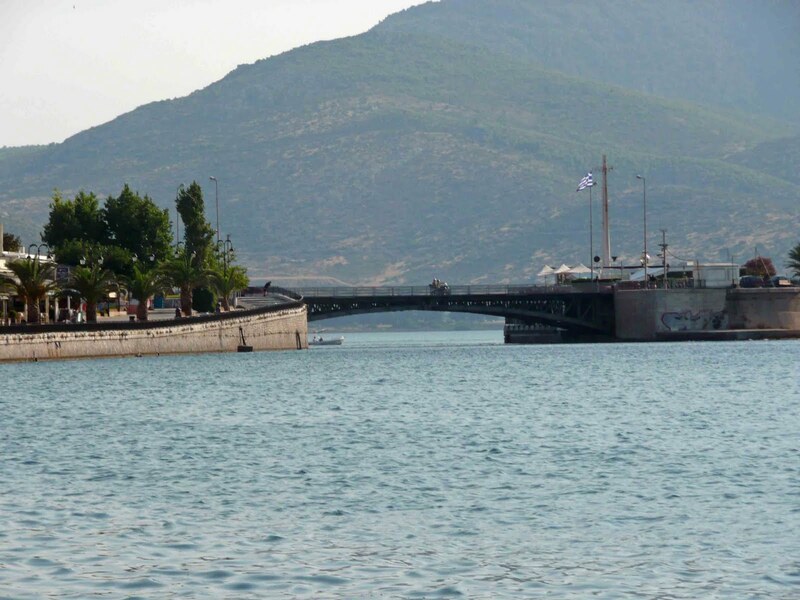 In fact the main port, Pithagorio, as the name suggests, is named after Pythagoras who was born here in 580BC. The town is built on the ruins of the ancient capital of the island and the present day jetty is built on the foundations to the ancient breakwater. 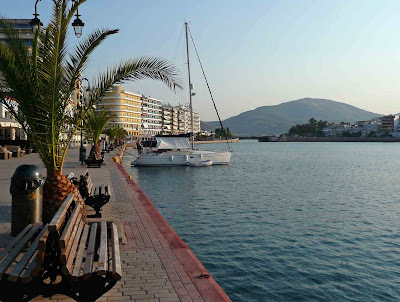 Now it is a very popular tourist destination as the numerous restaurants and bars along the harbour front and the mass of non Greeks frequenting them shows. Just outside Pithagorio lies Eupalinos's tunnel, a 1000m long aqueduct built in 529 to 524BC to provide ancient Samos with water. It remained in use until this century but perhaps the most remarkable fact is that so accurate was the surveying that when the work crews met having begun from opposite sides of the mountain there was nil vertical error. 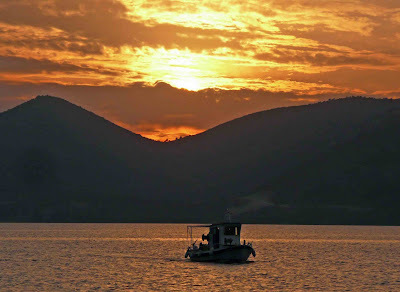 To break the journey between Samos and the islands to the north we anchored for the night at a bay on the Turkish coast. 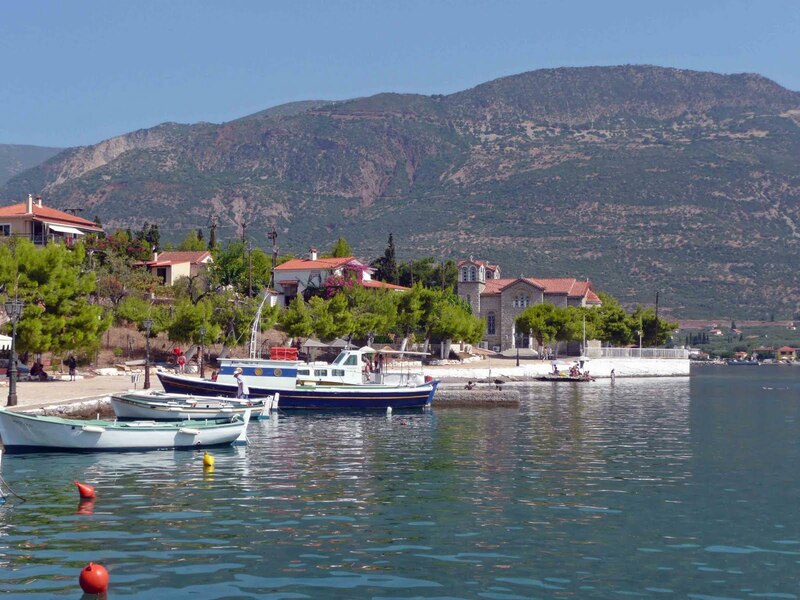 On the face of it Sarpadere Limani appears to be a pleasant enough anchorage with good holding on a sandy bottom although open to the south west. In fact when the north westerly breeze set in we were invaded by a plague of flies. So many of them did we swat below decks that Bella resembled a 'Garibaldi' factory. It is a place to avoid at all cost! 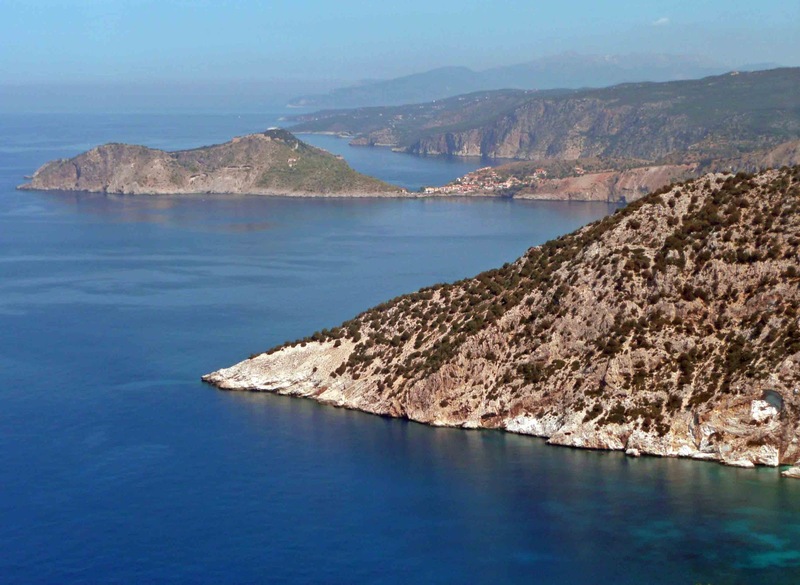 Once again we had some good sailing during the 32 mile trip to the tiny island of Oinoussa passing the large Greek island of Chios to port and the Turkish mainland to starboard. We had decided not to call in at Chios, although this verdant yet mountainous Island is reputed to be one of the most beautiful in the Aegean, as the facilities for yachts are not good. Chios's main claim to fame, apart from being the birthplace of Homer, is the production of mastic from the mastic bush in twenty fortified 14th to 15th century settlements, or mastichochoria, in the south of the Island. This bush that grows nowhere else in the world secretes a resin or gum that, before the advent of petroleum based products, formed the basis of paints, cosmetics and medicines. Now this mastic is the 'chew' in all the gum chewed quite disgustingly throughout the world and spat out to foul our pavements. 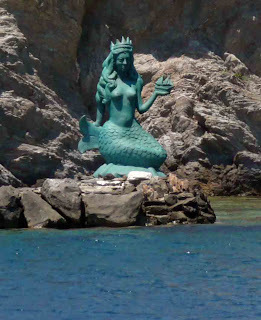 A lovely statue of a mermaid grasping a ship welcomes one to Mandraki harbour on the island of Oinoussa. The tiny islets that protect the harbour from the ravages of the southerly winter storms both have monasteries built atop them. We presented our papers to the Port Police which were duly stamped many times in many places and an invoice in quadruplet issued for our mooring fees of about €6 per day. 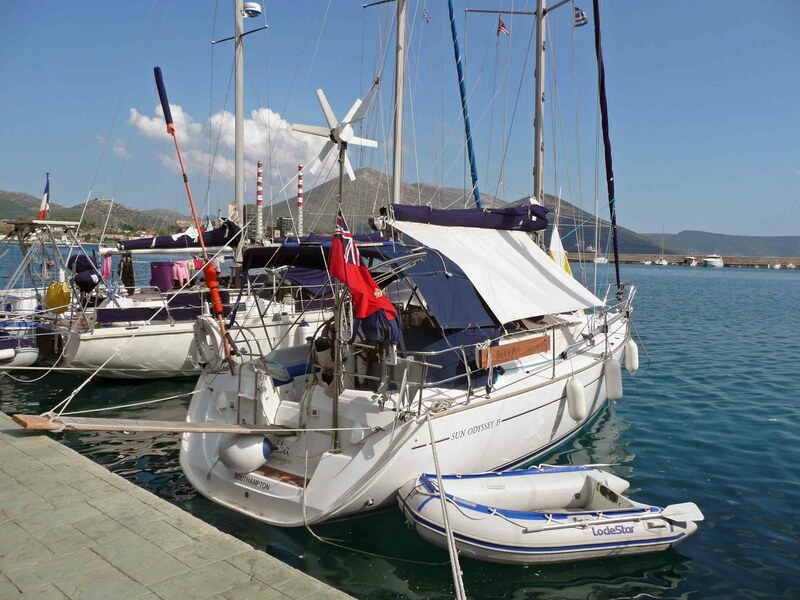 It seems that there has been a change in policy about stamping the DEKPA (permit to sail in Greek waters). Last year we were told that a stamp on the document about once a month would suffice but now it appears that every Port Police officer in the land wants to have a go. 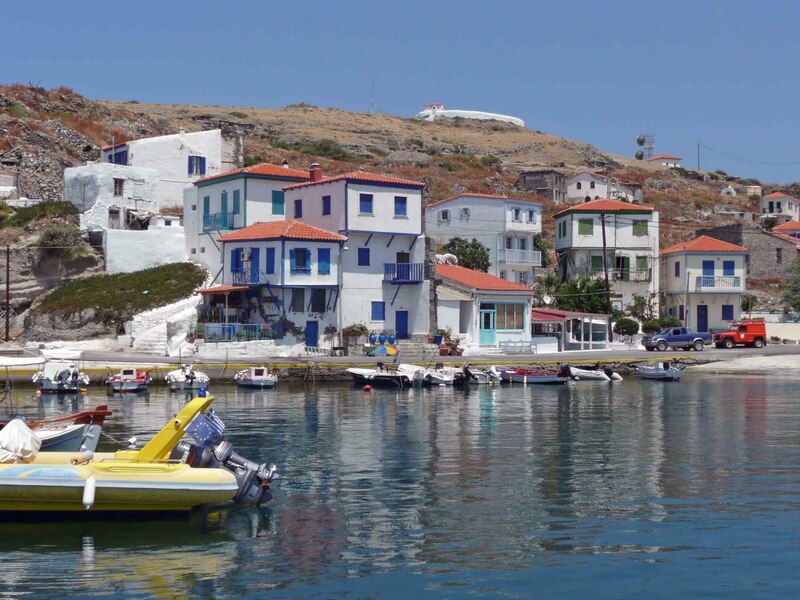 The modest island of Oinoussa is an appealing, peaceful place that was home to some of the wealthiest Greek ship owners. 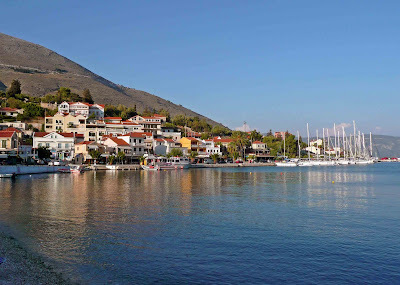 Their impressive mansions and the houses of ship captains line the waterfront and the hillside village. Peaceful the island is at this time of year but apparently all changes from the 15th July to the 15th August when the rich and famous Greeks descend to escape the heat of the mainland. 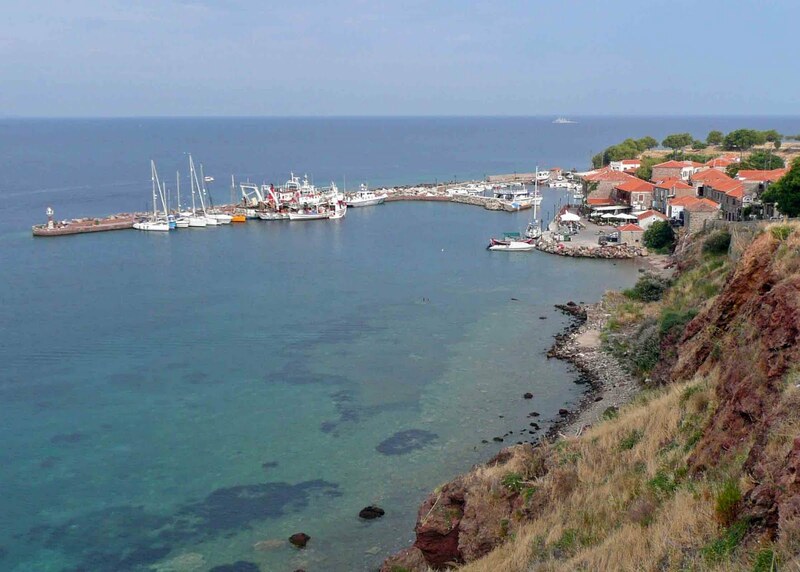 Oinoussa is one of the ten wealthiest territories in the whole of Greece. Our landfall on Lesvos, Greece's third largest island was at Plomario, an agreeable, bustling hillside town that gained its wealth as a major shipbuilding centre in the 19th century. 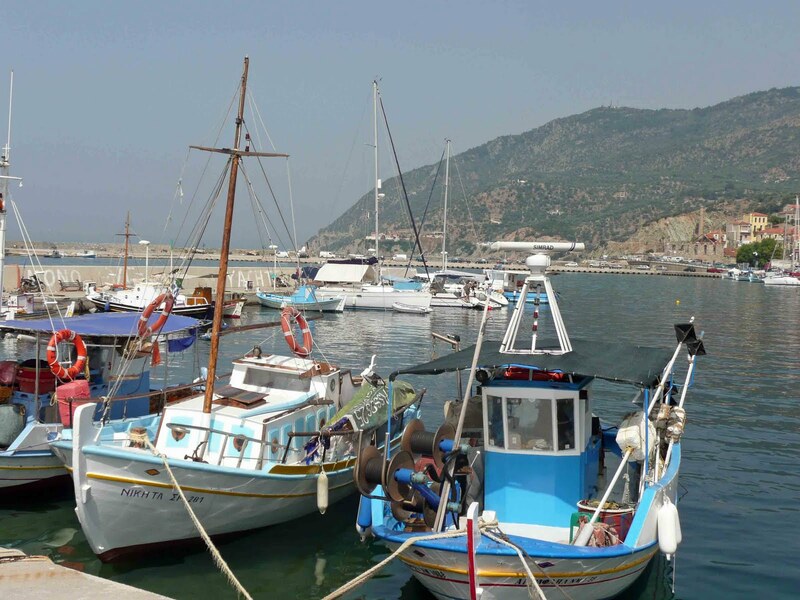 The shipbuilders have left and today the town claims to be the Ouzo capital of Greece with five distilleries producing exceptional Ouzo with an alcohol content of between 38% and 48%. The accepted minimum for a quality product is 44%! Ouzo is the Greek version of a spirit found throughout the Mediterranean. The residue of grape skins left from wine pressing is boiled in a copper still to make a distillate originally called raki, the Turkish name for the spirit. The raki is flavoured with star anise or fennel. 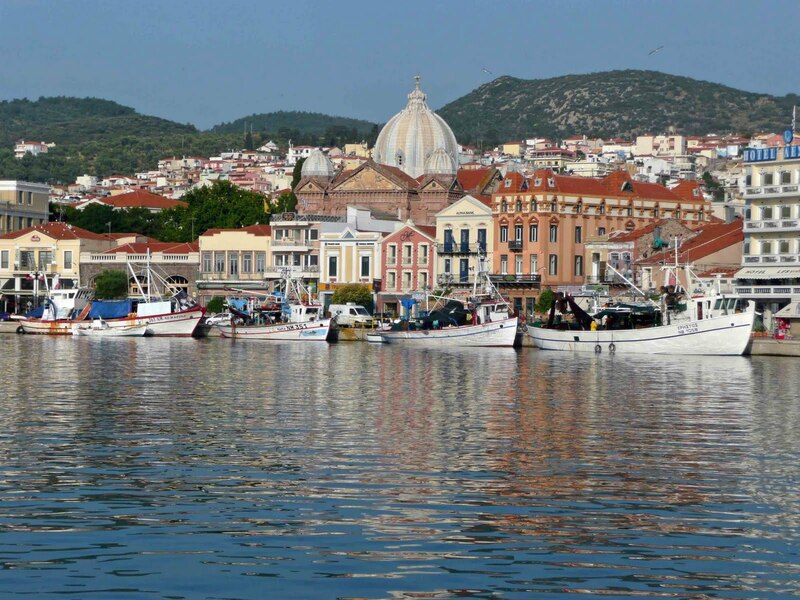 Lesvos, the birthplace of the 7th century BC poet Sappho, continues to support itself with fishing, ouzo production and olive farming. Tourism supplements rather than dominates these traditional industries. The 11 million olive trees on the Island are reputed to be the most productive oil bearing trees in Greece. The olives are cured for eating, pressed for oil or further crushed for oil for soap. Even the remaining pulp is used as a fertilizer. The saga of DEKPA stamping continued with a Greek Kiwi Port Police officer assuring us that the document should be stamped just once a month and that those who have insisted otherwise are young inexperienced officers who did not know the law or practice. We were just one of three yachts in Plomario harbour and are moored stern to amongst small fishing caigues. 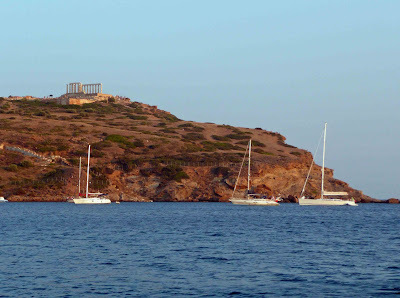 It all seems very Greek after the crush of yachts further south. This appears to be a cruising ground for the few privately owned yachts straying north rather than a charter playground. Mitilini, the capital of the island, had little to offer us but there are an amazing number of young local people in the town, a good number of the girls being very attractive and showing a lot of leg. Yet again we had a cracking sail all the way from Mitilini to the anchorage at Turkish Camlik Koyu within the Ayvalik 'Lake'. 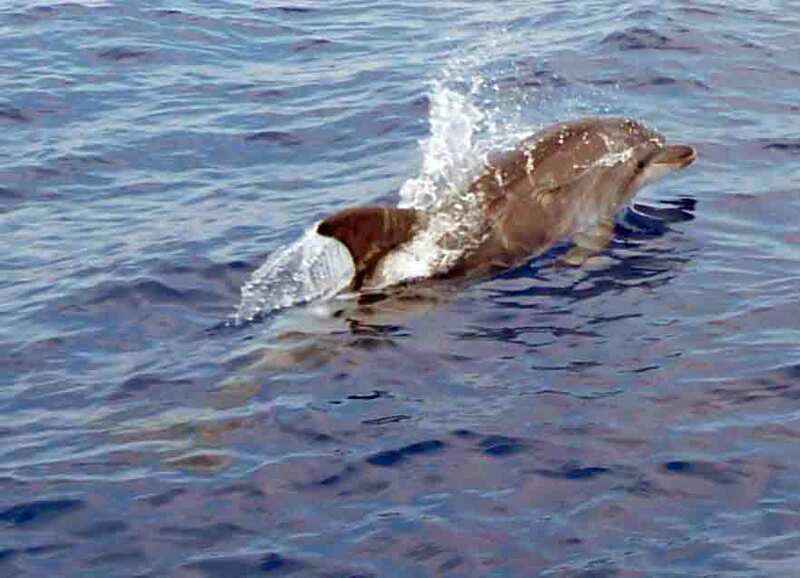 Dolphins accompanied us for a good part of the journey as did the ever present Yelkouan Shearwaters expertly gliding so close to the water surface. They do have a bit of trouble landing and taking off however both operations being far from graceful. The landing takes the form of an ungainly plop into the ocean accompanied by a good deal of spray and the taking off involves a lot of 'peddling' and rapid wing flapping before getting airborne. We dropped the hook in Camlik Koyu which is virtually landlocked but very much more developed than described in the pilot book. We moved to the nearby much more pleasant and equally well sheltered anchorage at Kumru Koyu. 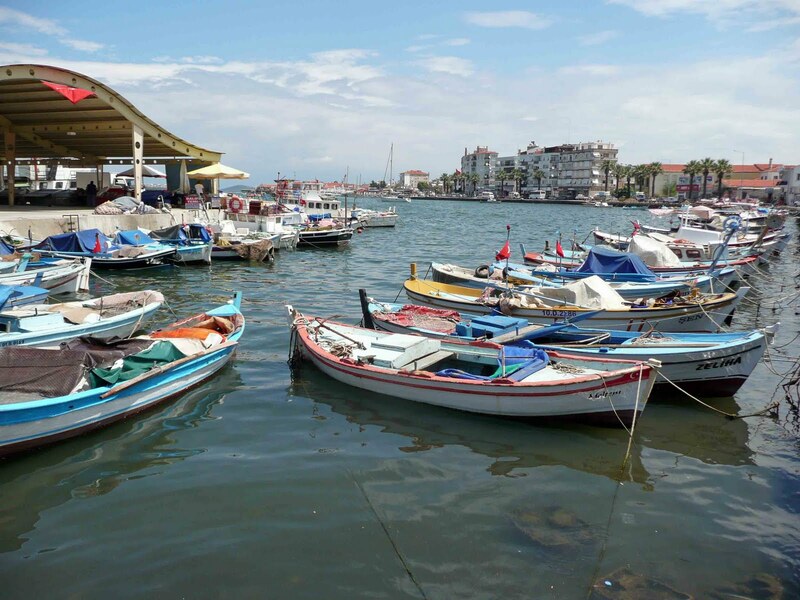 Ayvalik town was one of the many on the Aegean coast populated by the Greeks until the population exchange in 1923 and many Greek stone buildings remain but it prospered in the 19th century with the production of olive oil, soap, wine and salt. There is an extensive Thursday market including a vast fruit and vegetable marketplace where we stocked up on superb quality produce. It is a pleasant working town where tourism is in its infancy. We had a beer in a cafe on the pavement served in tea mugs so it didn't resemble alcohol! Ayvalik sits on the shore of a virtually landlocked lake the only entrance to which is a narrow, shallow buoyed channel and the small marina is remarkably full of small Turkish yachts and very few visitors. 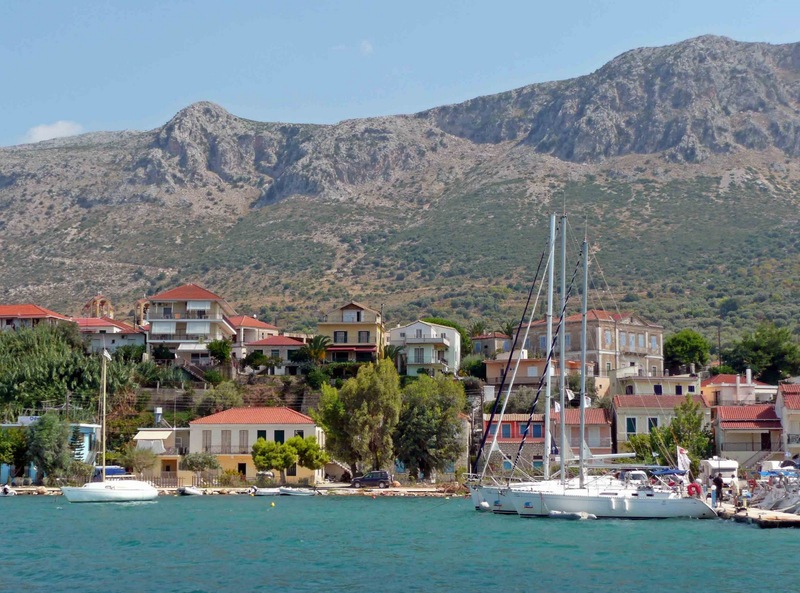 One of the joys of sailing in this part of the Aegean is the lack of yachts, particularly the charter yachts and gullets that plague the harbours and anchorages further south and east. 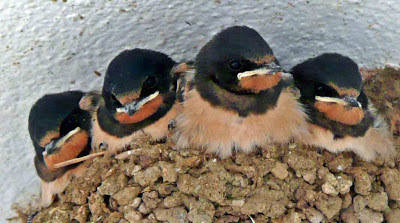 Four baby swallows being fed in their nest amused us. It seemed that the parents feeding regime is neither selective nor fair, the chick hollering loudest and pushing hardest winning out on every occasion. Perhaps we are being unfair and there is a rotation but perhaps also it is a case of the survival of the strongest. No doubt Darwin, or to be more accurate Wallace who actually did the research and wrote the paper could tell us. It seems that Darwin did recognise Wallace in the early publication of the 'theory' but that his name disappeared as time progressed. One of the baby swallows flew out of the nest or more likely fell considering the cramped conditions. It caused great consternation to the adults and it took them some time and expertise in persuasion and demonstration to guide the bemused and, we guess somewhat frightened, chick back into the fold. 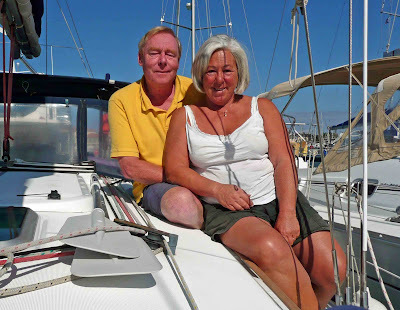 We slipped our mooring lines for the last time from a Turkish dock at about 0730 for the 26 mile sail to Mithymna on the north coast of Lesvos. 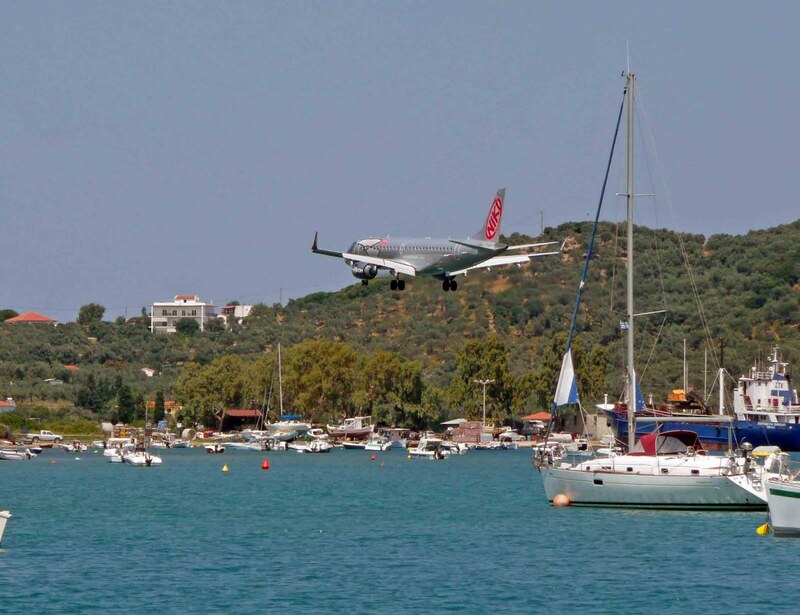 Turkey is a special place and its people and their hospitality, the scenery and the way of life we will miss greatly. We will carry fond memories with us forever. Dolphins in the buoyed channel from Ayvalik Lake to the open sea came to say farewell. 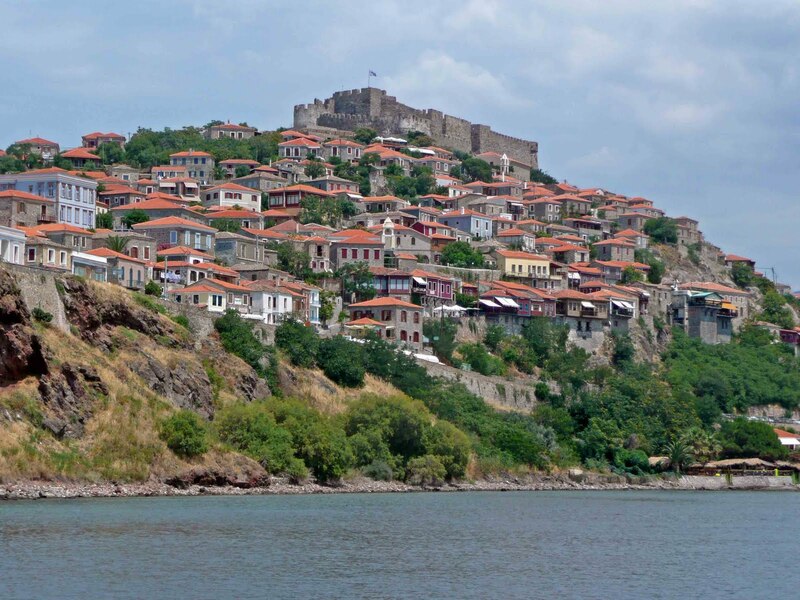 A vast Byzantine castle, later modified by the Genoese, perched high on a hill marks the picturesque town on Mithymna or Molyvos whose houses hang on the steep slopes below. Prior to the population exchange in 1923 over a third of the inhabitants were Muslim landed gentry who graced the town with many fine three storey mansions and a dozen street fountains some of which retain their ornate Arabic inscriptions in stone. The main streets are cobbled and steep but totally shaded being, unusually, covered with vines. In fact antiquity Mithymna was renowned for its vineyards. The town is popular with tourists who flock to the many restaurants and it is a haunt for artists perhaps in the wake of the 7th century BC poet Arion who was born here. Legend has it that Achilles besieged the town until the king's daughter fell in love with him and opened the gates though he slayed her for her treachery! 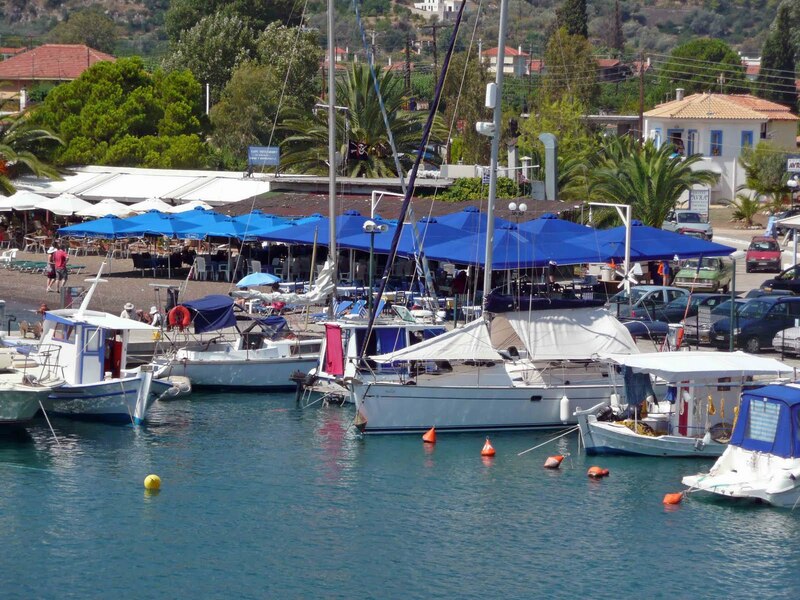 The harbour, surrounded by Tavernas and bars, is a pleasant if a bit rolly place to be. 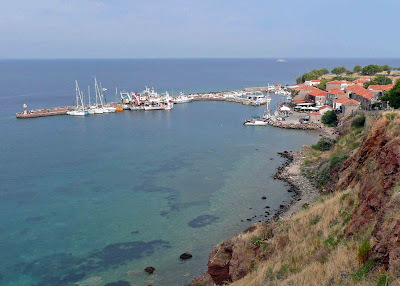 A short hop along the north coast of Lesvos took us to Sigri the on the westernmost tip of the Island and our departure place for striking west across the Aegean. The western half of Lesvos, in stark contrast to the green and fertile east, is dry and barren. This may be because of the weather or past deforestation or perhaps the fact that the region is volcanic. 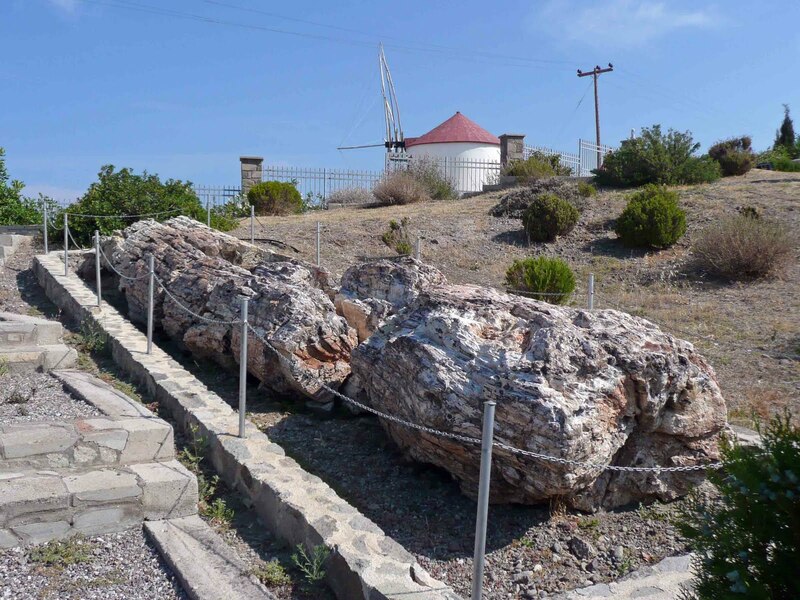 The area around Sigri has been declared a European Geopark because of its 'petrified forest'. Yes, trees have been turned to stone where they stand having been buried by volcanic ash and basalt for 20 million years! Little Sigri town has a world class Natural History Museum focusing very much on volcanic action and the petrified remains of plant life of the distant past. The exhibits are quite extraordinary. Sigri town is not picturesque but it is functional and pleasant. Greek life goes on as it has for years without the interference of the tourist; for the moment that is! The anchorage at Sigri is well protected and peaceful. That is as long as one manages to get the yacht into the anchorage in the first place! Having made our northing since the beginning of May we now strike out westward toward the Sporades Island breaking the journey about half way at the tiny barren volcanic island of Ay Efstratios. The Island suffered a catastrophic earthquake in 1968 in which many lives were lost. It has a population of less than 500 most of whom live in the one fishing hamlet situated on the western coast. Ruins of collapsed houses of the former hillside village remain as a poignant reminder and the hamlet has been rebuilt wisely with single storey construction in the valley below. There is the look of determination yet happiness on the faces of the local people, not many of whom are aged. Ay Efstratios is a thoroughly agreeable place and we are glad to have decided at the last moment to include the Island, the most northerly Greek island that we shall visit, in our travels. Neal, a retired Chartered Building Surveyor ran an RYA sailing school for 10 years before setting off on this trip. Miggy was a community nurse for 32 years.